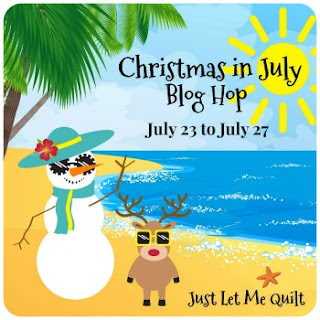 It's my day (along with several others) to share a little Christmas in July fun. I feel so lucky to have such amazing and talented blogger friends...you all rock! Earlier in the month I made a quilt for a Riley Blake Designs blog tour. I loved the fabric so much, I used the leftover fabric to make a table runner. The fabric, Christmas Delivery, is cute and beautiful! The quilt and runner patterns can be found in my Craftsy shop HERE. Check out the other incredibly talented bloggers. You'll be wow'd for sure! that I'd love to give to one lucky visitor. I can't contact you so you can't win. Giveaway ends on July 30, 2018, midnight MST. Thank you, thank you, thank you, for stopping by to visit! It's great motivation to be a part of a blog hop and you make lots of new friends. This hop is in September...let me know if you want to join in. 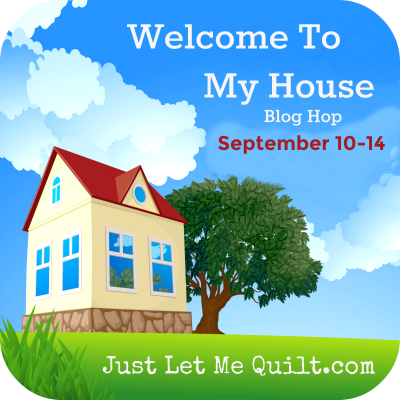 Welcome To My House blog hop requires a house to be somewhere on your project. Beautiful projects. The table runner is my favourite. I love your quilt and table runner! Thanks for the chance to win. Your runner and quilt are fantastic! Really nice patterns! The table runner is just too adorable! I can see it made vertically also to turn into a cute hanging quilt! Both the table runner and quilt are really cute, Carol. I’ve quietly visited all the participants. How fun to be a little bit ready for the season that will be upon us before we know it. Lots of inspiration. OH wow!! Carol, I adore your quilt and runner. This is one stunning pattern! Thanks for the fun week. Cute table runner Carol, and nice quilt too. Thanks for a great blog hop and giveaway. Thank you for the awesome blog hop, everyone's projects were fabulous, yours included! I am in love with your table runner, so cute! Cute, cute, cute, Carol--as always. It has been fun seeing what is going on in bloggerland with this hop. THX for hosting it and the giveaway chance. Riley Blake fabric is the best! That is such a cute line of fabric; I can see why you love it. I thought some of the fabrics could easily be used other times of the year and no one would be the wiser. I'm in love with the red pickup and how you designed the table runner. Waaay baaaack when, Dad tied the branches of our tree together and then tied it to the top of the car. That trek to the woods to get our tree and getting it into the house, was a super time. Such a cute pattern and thanks for the tute. I'm going to give the runner a try. Thank for hosting the hop. I did not really have the time to enjoy this one, so I'm going back Sunday and visit all participants. Thanks again for all you do. Such a cute quilt and table runner! As always, the hop you organized was such fun. I enjoyed every day and saw some terrific projects. Thanks for all you do; I know you are the driving force in the hops. Love, love the table runner. Thanks for all the hard work you have done to make such a successful hop. Love the table runner, Carol! Your creativity amazes me. The blog hop has been great, as always. I've been pondering the "House" hop, but not sure I want to commit just yet. Will try to decide soon and check to see if there is still room for me. Thanks for sharing your ideas! Well my name is all over this. I am totally loving the truck and tree theme the holidays. I have been buying ornaments for a theme tree in the foyer. Did I mention, I also hoard Charm packs with over 60 in my collection. But these I would need to use! Thanks for the hop! make with it... Thanks for all the inspiration. The table runner and quilt are wonderful holiday memories. So fun, so happy. Thanks for hosting this event and your positive spin on hops. They are such a great time spent with old and new friends. thank you for being a part of the tour today. i love your table runner and quilt. until today i have not really thought of fabrics like these. but they are so fun. thanks for the inspiration. The quilt is incredibly cute! My daughter and her husband would love that. His dad has an old truck like that, and they've decorated with some red truck prints. Not that I'd have time to make the quilt. LOL Maybe a table runner. Troy lost his dad in May. 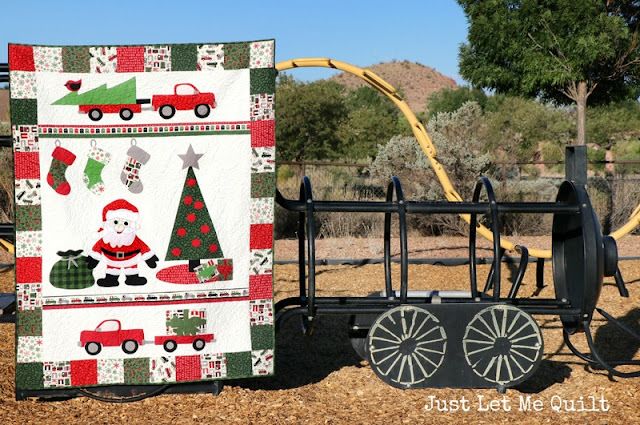 Love your Christmas truck quilt. It's adorable. Have really enjoyed all of the posts for this blog hop. Thanks for all the inspiration! OH MY!!! Both projects are adorable! I especially love that tablerunner! That's great to be able to make a table runner with the extra fabrics. You'll enjoy that! This has been a fun hop, with all sorts of different quilty Christmas items. Great to see what other quilters come up with to get ideas flowing. Thanks! I love the trucks with the trees in them. And the fabric is extra sweet. I have only seen it online so am hoping to find it in a store soon. Fantastic quilt and runner!! Thanks for hosting the hop! So very cute! I love the fabric.! Love your tablerunner! Love anything with old red trucks on it. Loving that table runner! Such a fun hop! Happy Weekend! Oh, that quilt is so adorable. And I love the table runner. Now I want to make one even though I have other projects that need finished. Thank you for the pattern. Oh, Carol, your projects are adorable! Especially love the table runner with the truck. You always come up with the best ideas for beautiful and unique quilts and sewing projects. And I wouldn't say no to winning your giveaway! I like it as a table runner, too! A great design. This has been so much fun. I hope we come back again next July! Thanks for the giveaway chance. Your projects are always so cute and so well made. The whimsy leaves a smile on my face. Love your projects with yhis great fabric collection. Thank you for sharing. Both your table runner and quilt are awesome, Carol! Thanks for sharing. I love patterns with old trucks and Christmas trees - I think they are my favorite Christmas patterns!! This line is also great. Thanks for the opportunity to win! 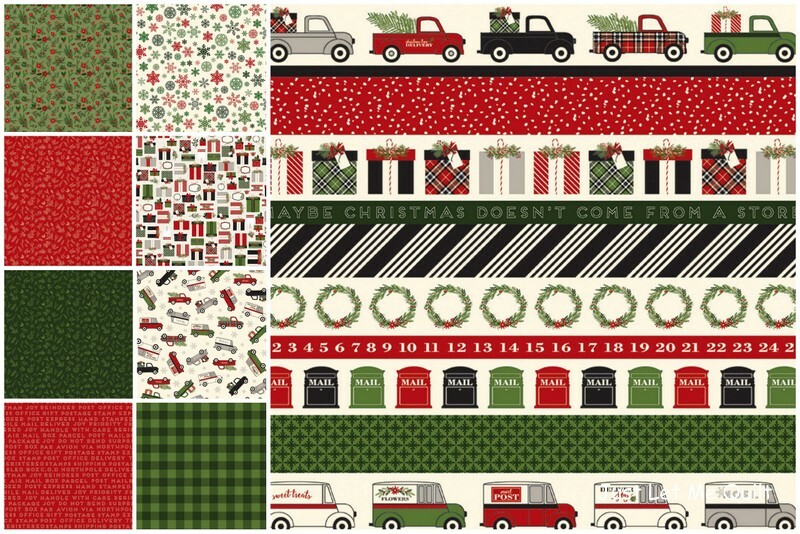 Christmas Delivery is such a great fabric line--Love your truck table runner! I'm a bit late to this blog hop but that's okay. I adore both of your projects. Your table runner is so cute especially the little birdie on the tree. I'm late too! I was out of town last week, and finally have time to look at the blog hop posts. Love your table runner! The fabric is just perfect for it. Thanks again for hosting, and Merry Christmas! Thank you Carol!! I am so lucky to have won these charm packs. What should I make??!! Real Christmas treasures, Carol! I esp. love the table runner.